Gloucester snatched a thrilling last-gasp Premiership win against Newcastle Falcons to extend their winning run to nine straight games. It was harsh on Newcastle, who led 27-13 at half-time before the home side launched a fightback. The Cherry & Whites, who play Edinburgh in the European Challenge Cup final on Friday, picked up a try bonus-point. They trailed 40-23 with 10 minutes to go but ran in three tries to seal a famous win on home soil at Kingsholm. On the negative side for Gloucester, England winger Jonny May, Sione Kalamafoni and Dan Murphy all limped off to leave their participation in next weekend's showpiece in doubt. In what was an enjoyable and open encounter, Dean Richards' Newcastle side looked to have established a comfortable platform with their first-half efforts, but will have to make do with a losing bonus point. Three excellent first-half tries showcased a range of Falcons' skills, with Mark Wilson holding off the cover to race in, Sinoti Sinoti taking in a pass after Ally Hogg was put through and Scott Lawson burrowing over from a rolling maul. 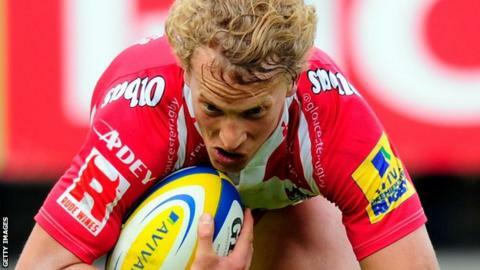 Billy Burns, who missed from the tee early on, created a try for Billy Twelvetrees with a line break and popped over a brace of penalties to put Gloucester on the board. However, Rory Clegg was also in form from the tee and his own brace gave the visitors a two-score lead at the break. It took Gloucester until the final 10 minutes to launch a real attempt to claw back the game as the game opened up. Dan Robson crossed before Josh Furno went in to leave Newcastle looking comfortable but two quickfire scores by Billy Twelvetrees and Henry Purdy set up an tense finish. David Humphreys' side pounded the Falcons line, being rewarded when a free-kick was tapped and worked to the left side for Burns to touch down and spark celebrations. "You can't coach character, you can't coach spirit, and I think in the second-half today you saw the spirit that's in this team." "In the build up to this game we were aware we've a European Cup Final next Friday night. "That is a huge day out for everybody associated with the club, but at the same time we knew we had to perform today, we knew we had to win today, to give us that momentum going into the game. "Over the season there are games we felt we should have won that we didn't win. Today was a game that maybe we didn't deserve to win but we worked so hard and showed enormous spirit to come back and seal the victory." "We felt we were in a with real shout, so it's very disappointing, We gave them some easy points and, surprisingly, we tired a bit. "Rory Clegg's kicking was impeccable and it's a pity that he missed that tackle at the end. "We always knew they had the ability to come back and their impact players made a big difference. It was a good surface to play on and Gloucester are a good team to play against as they play attacking rugby." Gloucester: Sharples; May, Macken, Twelvetrees (capt), Purdy; Burns, Robson; Thomas, Dawidiuk, Puafisi, Stooke, Galarza, Moriarty, Kvesic, Kalamafoni. Replacements: Hibbard, Murphy, Afoa, Savage, Evans, Laidlaw, Hook, Meakes. Newcastle Falcons: Hammersley; Tait, Harris, Sacino, Sinoti; Clegg, Tipuna; Vickers, Lawson, Brookes, Furno, Thompson, Wilson, Welch (capt), Hogg. Replacements: McGuigan, Fry, Orlandi, Witty, Robinson, Takulua, Tuilagi, Powell.